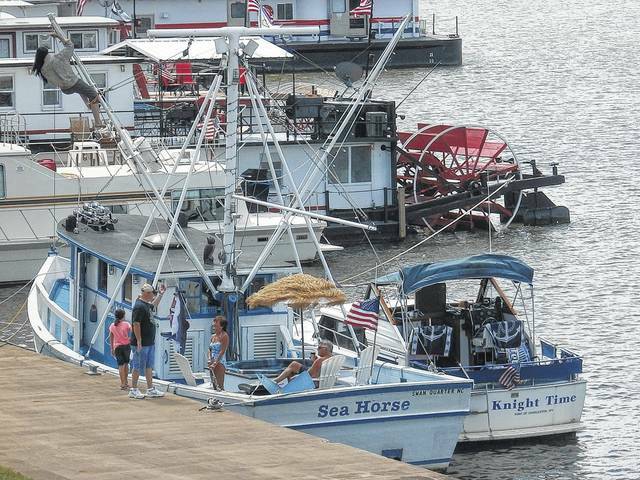 Festival goers will be able to see many boats parked along the Riverfront Park during the festival. The fireworks show is expected to bring an even bigger and better “boom” for the 2018 Tribute to the River festival. Last year, fireworks were added to the itinerary of the festival. People have been given the opportunity to be a sponsor of this event by purchasing a “boom,” which is one of the rockets of the fireworks show. Each boom costs $25 explained Jack Fowler, Point Pleasant River Museum director, and people are welcome to purchase as many “booms” as they desire. The sponsor’s name will be announced once during the day and again prior to the shooting of the rockets. 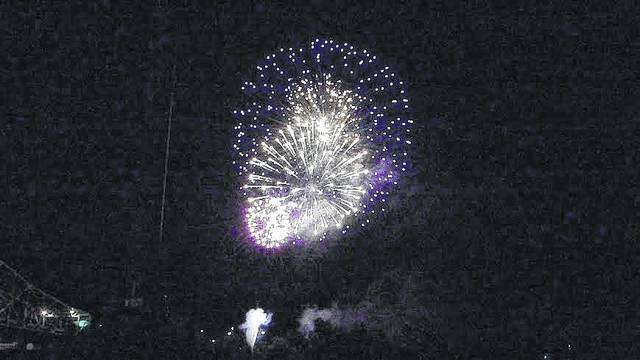 The fireworks show will start at 9:30 p.m., Saturday, Sept. 1 at the Riverfront Park. Fowler commented the fireworks will be let off from a barge on the Ohio River. The show is expected to be even bigger and better this year said Fowler. The Tribute to the River festival kicks off on Friday, Aug. 31 in the evening, along with the scheduled Mayor’s Night Out performance by Karen Allen at 8 p.m. at the Riverfront Park Stage. Fowler shared all of the boats will be arriving by Friday evening as well. The festival is no cost to attend and various concessions will be open around Riverfront Park. On Saturday, Sept. 1, the day’s events begin early with the Captains’ Breakfast at Christ Episcopal Church located at 804 Main Street beginning at 8 a.m. and lasting until 11 a.m. Fowler said the breakfast is open to the public and transportation will be provided from the Riverfront Park to the church. He added there will be prizes given away during the breakfast and individuals can buy tickets to entered in to win these prizes. Books of six tickets are available for $5 a piece and can be purchased at the river museum. Beginning at 10 a.m., tow boat tours will be open until 6 p.m and from 1 p.m.-5 p.m. inflatables will open for the children. At 10:30 a.m., festival goers will be able to sign up for the line throw contest beginning at 2 p.m. and the kayak races beginning at 12:30 p.m.
Plaques will be given to the first, second, and third place winners of the line throw contest. Medallions will be given to the first, second, and third place winners in each class of the kayak races. The classes will be divided as boats up 12 ft. feet, boats up to 17 ft. long, and boats above 17 ft. long. The children’s class will just be free range commented Fowler. He explained the route for the race will be up the river one mile and back and lanes will be marked off making the race as professional as possible. Fowler added the safety patrol will be there as well. He encourages recreational kayakers to join in on the race. The Children’s Lip Sync Competition will begin at 11 a.m., children’s games with Denise Bonecutter will begin under the tent at noon, and a Riverworks Discovery presentation will be held at 2 p.m.
Fowler explained those interested in the lip sync competition need to bring their own music to give to the D.J. prior to their performance. Medallions will be given to the first, second, and third place winner. A new event to the festival will begin at 4 p.m., a recreational boat class conducted by the Coast Guard. Fowler explained all boaters should be aware of the rules and regulations of recreational boating. The class will be held at the Fort Randolph Community Building. The first responders who all volunteered their time during the river museum fire will be recognized at 5:15 p.m. Fowler commented he hopes at least one representative is present for each crew that responded. At 6 p.m., the Lifetime Achievement Award will be presented to Bub Crane from Pittsburgh, Pa., following the Tribute to the River memorial service which honors the deceased men and women who worked on the river. Stephanie Stacy and the Aftermath will take the Riverfront Park Stage at 8 p.m. and the split the pot drawing will take place at 9 p.m.
Fowler commented the Tribute to the River this year should be “an outstanding event.” He extended a thank you to those who helped with the event including Captain Don Patterson, Butch Leport, Les Farley and his wife, Amherst Madison, INC., AEP River Operations, Kanawha River Navy, American Sternwheel Association, Riverworks Discovery, and many other friends of the river museum. Fowler encourages those who wish to become more involved with the river museum and its future should consider becoming a friend of the river museum as anyone can join. He explained the future plans for the river museum will be made public as soon as all is settled with the insurance company. Fowler also commented tickets for the upcoming Landau Murphy holiday concert are still available with good seats open for purchase. For further information, contact the river museum at (304) 674-0144.